Adoration – spending time with the Lord – gives us the peace that the world cannot give. Adoration is a powerful time of prayer and healing. It is a time of relaxing with Jesus. Adoration is a weekly routine to be in touch with Jesus who loves us and wants to hear our requests as God’s own adopted children. Adoration is peace and tranquility – closeness to Jesus that cannot be described. The Holy Eucharist is exposed for Adoration in the Chapel of the English Martyrs every Wednesday and Friday from 8:15 am – 7:00 pm. 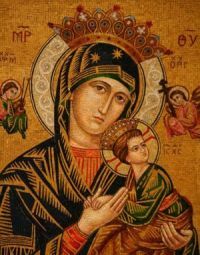 Mother of Perpetual Help Devotions Mother of Perpetual Help Devotions are celebrated every Monday evening at 6:15 pm. This formal devotion consists of novena prayers to Our Lady of Perpetual Help and Benediction of the Blessed Sacrament. Parishioners are encouraged to participate in this devotion to the Most Blessed Virgin. Through the intercession of the Blessed Virgin, may God continue to bless our parish and the work that is done here at our Basilica. A shrine to Our Lady of Perpetual Help, including a large mosaic of the icon, is located in the back of the nave of the Basilica. A Rosary for life, marriage & family issues, sponsored by the Culture of Life Ministry, is prayed each Thursday after the 12:05 PM Mass. If you are unable to join us perhaps you would like to say a rosary at home for this intention. The Rosary is also prayed at 8:25 AM on Saturday mornings. Stations of the Cross The Stations of the Cross is a prayer of meditation focused on the final moments in the life of Christ, from His condemnation by Pilate to his death and burial. Traditionally this prayer is offered during the Season of Lent in preparation for the remembrance of Christ suffering, death and resurrection. The Stations of the Cross are prayed in the Basilica on Fridays evenings of Lent. Celebrated during the Easter Season, the Stations of Light is a devotion that focuses on the key moments after the death of Christ, beginning with the Resurrection and ending with the Descent of the Holy Spirit at Pentecost.